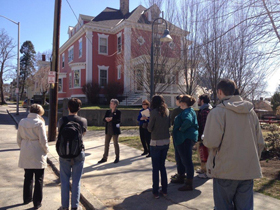 Above: Professor Greenwood's Introduction to Public History class tours the Main South neighborhood to learn about preservation efforts from Susan Ceccacci of Preservation Worcester. Clark's History Department, while small, is of unusually high quality, activity, and visibility in the field. Programs of study are available for both undergraduate and graduate students. Undergraduates can specialize in United States, European, or Global History. They can also take advantage of related interdisciplinary concentrations such as Asian Studies, Holocaust Studies, or Women's Studies. Graduate students can focus on America, with tracks in the history of the United States and in the history of the Atlantic World, or Holocaust History and Genocide Studies, with tracks in Holocaust History and in Genocide Studies. The department's close ties with the American Antiquarian Society (AAS) in Worcester and Old Sturbridge Village (OSV) in Sturbridge, Massachusetts are wonderful assets for students studying United States history. In addition to AAS and OSV, history students have done internships at the British Museum (as part of Clark's London Internship Program) and the Pleasant Street Neighborhood Network Center in Worcester.